These days, natural stone tile is a builder’s first choice because this is what most buyers prefer. Whether you are contracting for a commercial or residential builder, both might prefer some sort of natural stone to incorporate into their build. From most contractors’ perspective, stone is attractive. So, no matter what kind of stone you choose, whether it’s marble or travertine, you’re most likely going to get a return on investment with these types of building materials more than you would with standard materials. With almost anything, there’s going to be some drawbacks—if that’s what you want to call it. Some people are under the false pretense that by having natural stone flooring, countertops, or walls, you don’t have to worry about maintaining them because they’re so durable. The fact of the matter is if you have natural stone installed in your home, some type of upkeep is required. While most stones are waterproof, they can also be porous. This means that if it’s not treated properly, it can and will stain. If you’re choosing a white tile for your floor or countertop, you might want to consider other options like engineered stone. Some people might think that engineered stone is like a ‘fake’ stone, but it’s not. It’s still made of authentic stone! Engineered stone is a mixture of various rocks and minerals that are crushed and bound together with an adhesive. It’s considered engineered because it’s man-made, thanks to the adhesive. It’s that added component that seals any microscopic holes preventing any wine or ketchup stains to seep through, discoloring the surface. The most common types of minerals used for engineered stone is marble and quartz. Other materials might include geopolymers and cast stone. It also depends on what that engineered stone will be used for. Knowing if it’s going to be used for flooring, walls, or bathrooms make a difference, especially when you consider the adhesive. Polymer resin is the most common type of material used to bind the crushed stone together. However, there’s always some type of newer resins in the market. Once the grounded stone and resin are mixed together, then it is poured into blocks or slabs, and the cut and polished to give the appearance of natural stone. If you’re looking for a white stone tile for your building project, your distributor will most likely direct you to Bianco Dolomiti, a natural marble stone. Yet, because it’s a natural stone, you’ll most likely find evidence of other minerals within the slab giving it a slight hint of color. You’re less likely to find a natural stone that is fully white with no veining—especially with marble, even with its different color variations. Marble is formed deep within the earth through heat and pressure and is organically mixed with other rocks and fossil minerals nearby. So in a sense, both natural and engineered stone are made in the same way, except with engineered stone, the contents can be manipulated. This is why you now have the selection of singularly colored title. However, in order to achieve a pristine look, other type of materials may need to be incorporated, like glass. If you prefer to offer your buyers a cleaner look of tile than Bianco Dolomiti, you might want to consider a lighter kind of tile. Some builders tend to steer clear of white tile because it easily shows stains and markings. But it really depends on your preference, and of course location. For instance, if you live in the South Florida area—Miami in to be exact, then you’ll quickly learn that white tiling pairs well with the Art Deco style it’s so historically known for. White tiling can be used for other interior design applications as well. Countertops, shower stalls, and custom vanity sinks to name a few. What may be an issue is deciding what kind of white tile to choose. Nalboor Tiles, a wholesale distributor of natural and engineered tile, recommends either the Full Body Marmo Glass or the Laminated Marmo Glass if you truly want to achieve a cleaner-looking tile. Keeping in line with how engineered stone is made, Marmo glass is composed of crushed ceramic tile and white glass crystals. It is considered a more eco-friendly material that recycles materials in order to achieve a natural look. 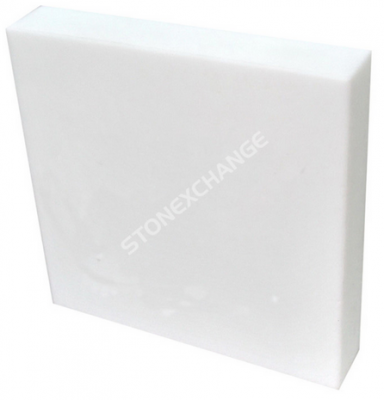 This Marmo glass tile can be installed anywhere you would normally install natural stone. Its properties are better than natural stone in that it doesn’t need the same type of upkeep. Marmo glass has zero water absorption, so you don’t have to worry about sealing it like marble or travertine. However, an anti slip sealer could definitely benefit such tile like this. Many people often wonder what the difference is between the Full-body and Laminated Marmo Glass tile. The answer explains it in the name. The laminated Marmo glass tile has a 2-3 mm laminate white glass coating over the porcelain backing which gives it an extra-added shine and making it the perfect choice for tile flooring. The Full Body Marmo Glass will have a more natural appearance because it doesn’t have the laminate coating. What you’ll get with the full body is a more stone-like feel and look that is similar to White Thassos marble. To place an order or get a free sample of either of our Marmo Glass tiles, call Nalboor Tiles at 305-501-4548, or contact us through our online form right now!